Step 1: Connect your 64-bit iOS 11.1.x device to your computer using a Lightning cable. 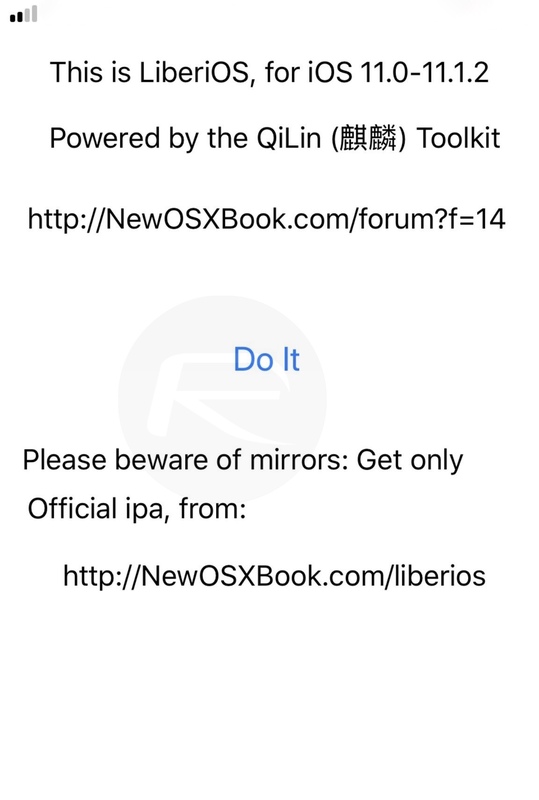 Step 2: Once done, launch Cydia Impactor on your computer and drag the LiberiOS jailbreak IPA file into its UI. Enter your Apple ID credentials when prompted and wait for Cydia Impactor to sideload the signed app on your connected device. If you are new to using Cydia Impactor, we will recommend checking out our separate detailed guide on how to use it to sideload IPA files here: Sideload iOS Apps On Windows, Mac With Cydia Impactor Without Jailbreak, Here’s How. Step 3: Once the app is sideloaded, launch Settings > General > Profile(s) & Device Management(on some iOS versions it could just be General > Device Management) and tap the profile associated with the jailbreak app. Make sure you trust this to allow the LiberiOS jailbreak app to launch. Step 4: Now head back to the Home screen where the LiberiOS app is installed and launch it. Tap the Do It button in the center of the app, sit back, and wait for it to do its thing. Step 5: After a short while, you will get a screen that looks like below, indicating that the jailbreak has been successful. That’s about it. Your device should now be jailbroken successfully! NOte : do not install anything from cydia until and unless cydia substrate and cydia gets updated ! My sister wanted to change her Android phone, so I gifted an iPhone to her, but she complained that she was unable to update iCloud settings because of some unknown issues, so I showed this- https://www.imentality.com/iphone-stuck-updating-icloud-settings-fix/ to her and we were able to solve the problem on our own.